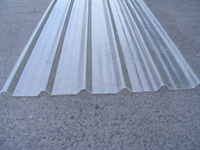 Our Roof Lights are 3 metres long and have a weight of 2.4kg per sq/metre. Although they are not completely clear, they let in excess of 80% of available light pass. Our roof lights are tough and long lasting and are fixed using same fixings as steel sheets.